Posted: Thu 02 Jun, 2011 8:14 pm Post subject: Show us your Arming Clothes! We have plenty of 'show us' threads dedicated to the bits that go on the outside, but what about what everyone's wearing under that fancy armor? As I learned the hard way when I started working on a kit, the most important parts are the foundation garments that the armor is attached to. I think if we compile some shots and descriptions of our arming clothes, people will have a better understanding of where to start, and what kind of things are appropriate for certain periods. For me, I'm working on a last quarter of the 14th Century English knight kit. I had the very fortunate experience of meeting with Jeff Wasson a couple weeks ago at his home and workshop in New York where I had measurements and casts done for some custom work that he will be doing for me, which I'm incredibly excited for. For the folks just starting out, all the armor bits have got to fit over and function as a unit with your arming clothes. Please add on to the collection and explain what you've got and how it functions so we can all benefit from one another's knowledge. For mine, here's how they break down and their function. Wool chauses pointed to linen braies (single leg hose and underwear) for the lower body. Then as a base layer I'm wearing a linen shirt, over which is a pourpoint (the tight fitting vest garment from which my leg harness will be suspended), and over that the padded gambeson. The pourpoint must fit tight over the hips so the weight of the cuisses are suspended from the hips instead of being transmitted up to the shoulders. 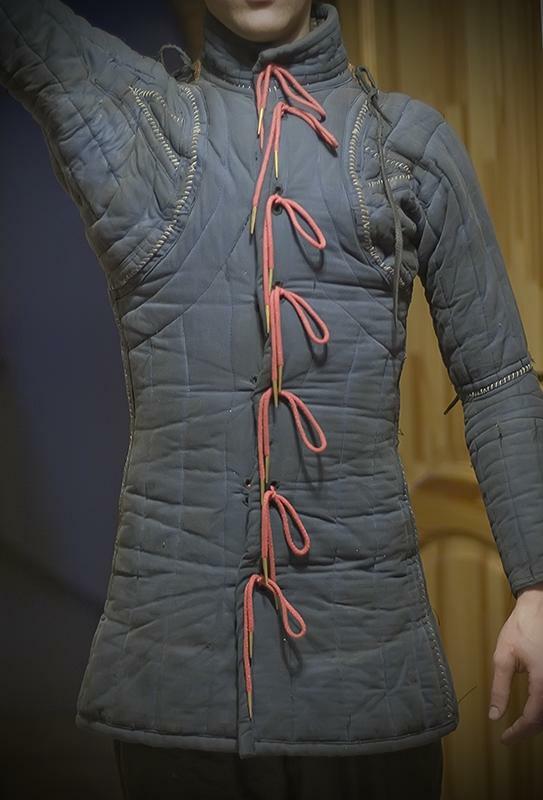 The gambeson functions as a padded base layer for a maille haubgergeon and pointing garment for the arm harness. In the next photo, you can see how a full maille haubergeon would fit over the gambeson. The arm harness would then point directly to the gambeson through the maille haubergeon. Posted: Thu 02 Jun, 2011 10:24 pm Post subject: Re: Show us your Arming Clothes! As I learned the hard way when I started working on a kit, the most important part is the foundation garments that the armor is attached to. AMEN TO THAT! Years ago I was using a cheap, piece of junk gambeson that my harness was pointed to. My harness felt too heavy, it hurt my back after about a half an hour, and my movement was very clunky. It tugged in ways that prevented me from standing in certain guards. While I logically knew that I needed a better foundation garment, it still blew me away when I made the switch. These days I use a Revival Clothing arming cotte for my late 15th century harness. (My cotte is a semi-custom order that is red rather than the standard black) I love, love, LOVE it. It completely changed everything about how I move in harness. The arms use the historical pattern which are specially designed so that you have full movement when strapped into harness (a t-shirt styled arm hole will not), and the waist gives fantastic support on the back so that the weight of the armor is distrubuted over the torso quite nicely. In fact, I injured my back last summer and needed to put on my harness for a class I was teaching. I was worried about it making my back worse, but to my amazement, it actually helped heal my back due to the wonderful support. After two hours of wearing armor, my back pain temporarily vanished for the rest of the night. I've had to make some minor adjustments to the location of the points for the legs, as they were a little low for me personally, but considering that this is an off-the-rack garment rather than a fully custom piece, that's a pretty simple adjustment that is completely justified. I don't really have many pics, unfortunately, but here's a pic of myself starting to suit up, and a pic of my full kit (along with some of my students). The only pic I have of the arming doublet itself. 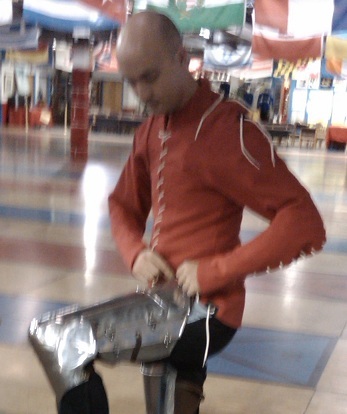 My arming "doublet", made it myself. I wear a sleeveless "pourpoint" underneath to which separate padded hose (or were they called chauses?) and leg armor are attached. I am very pleased with my current arming garments but I am starting to think that I actually don't need that much padding under full plate harness. After all, I currently don't feel the blows even if they dent my armor. can't find pictures of my wearing mine immediatly but a thing amazes me. why are most of you wearing a pourpoint underneath the arming doublet?surely the pourpoint was a strictly military garment(atleast here during the 15th century) but it was my understanding it was to be worn underneed padded jacks through which making points was way harder then underneed a normal arming doublet.? can't find pictures of my wearing mine immediatly but a thing amazes me. why are most of you wearing a pourpoint underneath the arming doublet? Most? There's only two people in this thread claiming to wear a pourpoint underneath their other clothing. And in at least one of those two (specifically Ian, the original poster) it's because the outer layer is the padded foundation for the mail, whereas the pourpoint is for the legs. He is wearing the Revival Clothing pieces, which are designed to go together. it was my understanding it was to be worn underneed padded jacks through which making points was way harder then underneed a normal arming doublet.? But isn't that exactly what Ian is doing in his pictures? He has the pourpoint on, and a padded gambeson on top of that. What Bill Grandy said. As far as I know you wear a pourpoint to hold up your hosen. You wear your arming doublet for your armour. ok, maybe most was an exageration but it was my understanding in the mid-late 15th century everything, even the joined hosen would be pointed to the arming doublet. was this different in the 14th century? most people except jack seem to have no points for suspending their hosen on as far as i can see. not trying to critizise since i love people who know their need a thin, thightfitting arming garment but just curious! In the 14th century hosen (split) were shown to be suspended from the braies or pourpoint. I wear mine currently pointed to my braies, but will be changing that shortly as my whole underarmour kit is changing to suit my 15th century kit. For me the reason is history. I made the pourpoint when I was wearing a gambeson comparable in thickness to jack and maille as body armor. When I switched to plate I continued to wear leg harness the way I used to. There are other advantages of pourpoint as well. For example it is easier to wash (or actually quicker to dry) than a padded gambeson so I can keep my clothes cleaner. Also I can take off upper armor when I want to rest without taking off leg harness. I would like to try and clarify some of what was going on with regard to hosen and pourpoints and such. This is how I do things, I'm not saying if it's right or wrong, but this is what works for me. I point my chauces (hosen) directly to the drawstring of my braies. There is a little cut out in the waist of the braies that exposes the drawstring, and I choose to point my hose using that. It works well for me and keeps the hose up and doesn't pull the braies down. I use this method for both soft and hard kit wearing of chauces. For my cuisses (forgive them please, I'm having much more accurate and better fitted cuisses done for my time period), now enter the pourpoint. My pourpoint is the one offered by Revival Clothing, and it's very snug fitting around the waist. In the photo you can see that I point the leather tab at the top of my cuisses to the pourpoint. The tight fitted garment keeps the weight of the cuisses on my hips and does not transmit the weight up to my shoulders (this is essential for fatigue reduction). Then finally, the padded gambeson goes on top of all that and acts as both a foundation for the maille, and a base from which to point my arm harness. 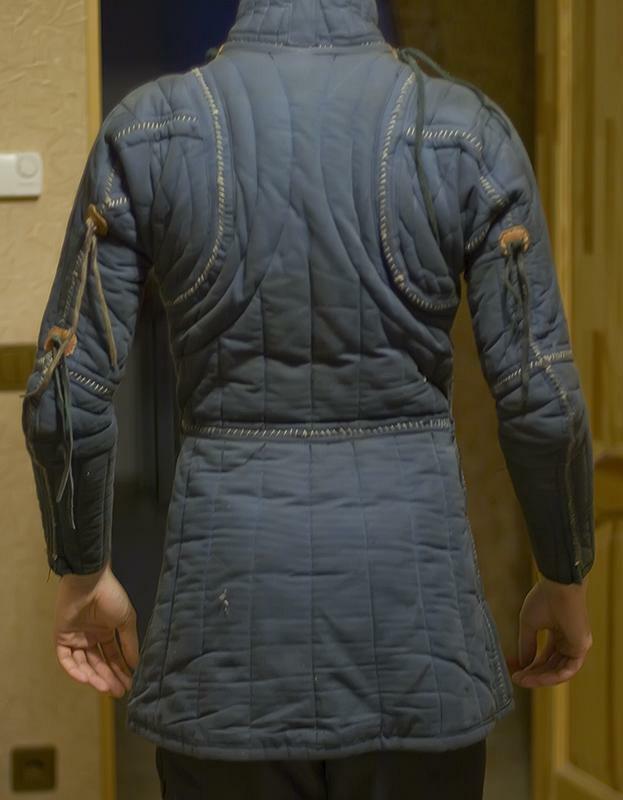 My gambeson is not designed to support the leg harness, but is nice and tight through the arms to prevent a pointed arm harness from moving around. Hopefully that clarifies what I was trying to do. This is my understanding of what would be plausible for the late 14th century, when wearing a full haubergeon in addition to plate defenses is appropriate. 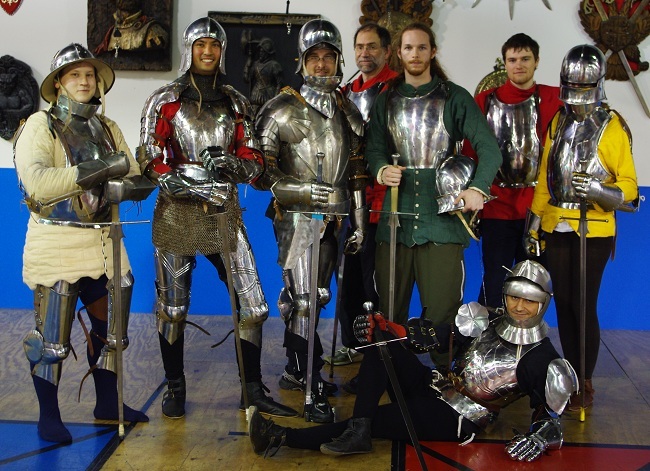 Come the 15th century, you can throw out everything I'm showing here and go with a nice fitted, un-padded arming doublet that can support all of your plate defenses (like what Bill Grandy is wearing in his first photo) and only requires voiders of maille sewn to it in the gaps. Ian, that's how i do all of my split hosen from the 11th to 14th centuries. in the 15thc the brais look like tighty whities in the images and show no attachment points for hosen. they start tying the hosen to the doublets directly. I am fairly sure that depends on what part of the 15th century one is talking about. I have seen artwork of the 15th showing braes with the hose attached. To me the difference is that they add another way in the 15th not that one is removed from usage. My feeling is that split hose and attached braes linger for a very long time among the lower classes as well. Single-leg, single-pointed hose persist well into the 15th Century, particularly amongst the lower classes. With the development of the doublet, hose begin to be pointed to the doublet rather than the breech girdle. The hose remain single-leg but are now fastened with multiple points to the leg. This style of hose survives from the late 14th Century until into the 16th Century. Single-leg hose, pointed to a doublet gives much more freedom of movement compared to joined hose; without compromising the fashionable look of exposing much of the leg. I suspect the single-leg style was much more prevalent than fully-joined hose with the majority of the population; leaving the joined hose for the highly fashionable. I'm appreciating this thread and enjoying the photos. I for one would benefit from reference to written sources for more information. Several of the posters in this thread are obviously quite knowledgeable on the topic. Where did you get your information?